"Delicious dressing great on its own or baked with your favorite meat. Originally submitted to ThanksgivingRecipe.com." Preheat oven to 350 degrees F (175 degrees C). Lightly butter a 2 quart casserole dish. Cover raisins with boiling water and let sit for 5 minutes. Drain well then toss them with the bread cubes. In a skillet melt the butter and saute the onions, garlic, and celery for about 4 to 5 minutes. Stir the sauteed onions into the bread cube mixture. Add the diced apples, parsley, salt and paprika and stir carefully. Place stuffing mix in the prepared dish or you can alternately place it in a large roaster with your favorite uncooked meat (pork chops, turkey, chicken, etc.). Bake the dressing for 30 to 40 minutes. If you are baking the dressing with meat cook it until the meat is completely done all the way through. It was very dry. Next time I will add some chicken broth to it. A quick shortcut is to use StoveTop stuffing and add all the fixin's to it. Taste great and so easy! YUM! 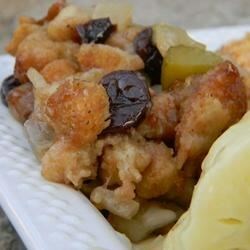 I make this stuffing every year now for Thanksgiving and it's always a hit. Use whole wheat bread for a nutty flavour. Add about 1/4 cup of chicken broth otherwise it's too dry. This was my first attempt at home made dressing & everyone loved it! I saved some out of the Turkey to serve as a side dressing & my vegeterian friends have asked for the recipe.